Not sure what activities are offered around the are? Check out our sample itineraries! Montana and the greater Yellowstone Areas are expansive places and can be tricky with kids, but it’s also a lot of fun and a great opportunity to make memories to last a lifetime! Make sure you plan for plenty of time out of the car and try to stay places along the way to avoid extra driving. Make reservations in advance because places rapidly fill up in the summer! Start off your journey in the city of Gardiner, just north of Yellowstone Park. Join Montana Whitewater for an exciting day of horseback riding followed by a rafting, our Paddle & Saddle trip! You will start your day off by meeting at the historic Stermitz Ranch for a horseback ride through wildflower fields and gradual mountains bordering Yellowstone National Park. Enjoy a BBQ lunch at the ranch, then head to Gardiner for rafting. The Yellowstone is a fun, splashy river suitable for children as young as 5 years of age. After rafting, drive 30 minutess north to Chico Hot Springs and stay the night with the family. Eat at the poolside grill and soak to your hearts content in the outdoor hot springs pools. Get your day started off right with an early morning soak and a breakfast buffet at Chico. Then, head through Gardiner, into the North Entrance of the Park and drive up to Mammoth Hot Springs (only 5 miles in). Make your first stop the Albright Visitor Center to find out about the Junior Ranger Program. This will give your kids a fun goal to accomplish while visiting the park! Spend some time exploring the boardwalks around the 2nd largest hot spring terrace in the world. Pick up a trail map at the visitor center if you want to get off the boardwalks. There are many hikes in the Mammoth area that can be as long or short as you like. If you’re not sure about using backcountry trails, ask about Ranger-led family hikes when you’re at the visitor center. Enjoy the lunch at the Terrace Grill in Mammoth or grab a picnic table and your sack lunch and sit outside. Spend part of the afternoon driving out to Tower/Roosevelt, looking for wildlife along the way (don’t forget the binoculars!). Stop at the Tower General Store and take a short walk to the falls overlook, maybe grab an ice cream, or continue on to Lamar Valley for more wildlife viewing potential. Head down to Canyon Village for the night. If your group isn’t too tired, you’ll want to attend the Ranger-led Evening Program at the Canyon Campground. A slide show and campfire is a great way to finish off a day in Yellowstone! Check for times in your park newspaper. Drive south to Yellowstone Lake. Connect with this beautiful, natural mountain lake with a shore hike and rock skipping. Are you boating enthusiasts? Rent an outboard or rowboat (first come, first served) from Xanterra Parks and Resorts at Bridge Bay Marina. Enjoy lunch at the Lake Lodge, then head to Old Faithful to see the famous geyser. Jet out the West Entrance and hit up one of the many accommodations like the WorldMark Hotel, the smaller Alpine Inn, or the KOA in West Yellowstone. Dinner at the Bar N Ranch is a fantastic way finish to the day. ZipLining and River Tubing or *Hangout in West Yellowstone! If the family is ready and excited for some more outdoor fun, get up early and grab breakfast at the Kiwi Take-away. Go North on Highway 191 about an hour to our Gallatin Location and enjoy a zip line trip. Eat lunch at the Blazing Paddles café, then continue North another 30 minutes to catch the 1:30 shuttle for Madison River Tubing. We will take you to a flat water section of river and provide a tube for a relaxing afternoon of fun! After the tube trip, head into Bozeman for a hotel and dinner (lots of options in this college town). *If the weather isn’t great or the kids need a slower day, spend the morning in West Yellowstone. You can go to the Grizzly and Wolf Discovery Center and participate in the Keeper Kids program. Kids learn first about grizzly bear eating habits then accompany the naturalist and animal keeper into the bear habitat to hide food for some of the resident bears. After the food is hidden, see how bears use their sense of smell to search out the food! Then, head north to Big Sky and grab a delicious lunch at Bugaboo Café. Finish the afternoon with a zip line tour, flying across the Gallatin River and head to Bozeman for the night. Choose your adventure for the day. You can drive about an hour west of Bozeman to enjoy a journey underground in the Lewis and Clark Caverns. View stalactites and stalagmites, while listening to great tales about Montana’s past from a tour guide. Another great option is to explore the historic Montana ghost town of Virginia City. This is about an hour and a half from Bozeman, but is a great way to spend the day. Go on a train ride, pan for gold and see how to make toffee at the famous local candy shop. Depending on the way you drive, you may pass Norris Hot Springs and can stop for a final relaxing soak on your way home. This place is deemed the “Water of the Gods”. If you hit it on a weekend night, live music will be playing poolside. You can also try out some yummy snacks made from local foods and enjoy a microbrew in the pool. To sum it up- rustic, wholesome, and soothing. This area sits on a huge thermal pocket, giving Yellowstone its unique ecosystem, but also offering a great recreation activity of hot springs soaking. Site-see the area with a relaxing thermal soak to start or end each day! Spend a couple nights in Bozeman. On the first day you can head to the Lewis and Clark Caverns and Virginia City for a look at Montana’s gold mining history and an amazing guided journey underground. On the way back to Bozeman stop at Norris Hot Springs for a relaxing soak. This place is a wooden pool with natural hot springs water and has been deemed the “Water of the Gods”. If you hit it on a weekend night, live music will be playing poolside. You can also try out some yummy snacks made from local foods and enjoy a microbrew in the pool. Norris Hot Springs Summary- rustic, wholesome, and soothing. After the soak, head back towards Four Corners and swing into the Corner Club for some Montana style wings, beer and pool. Or if you have kids, head home and put them to bed!!! Bozeman has a lot of hotels so pick the trusty chain of your choice. Drive up to the Gallatin Canyon for an exciting day of rafting and zip lining- the famous Zip & Dip Package! Soar across the Gallatin River like a bird, then raft down it! The Gallatin Canyon is punctuated with gorgeous limestone cliffs and Douglas Fir mountain sides. The river is crisp, clear and clean, bubbling with snowmelt. A great day to just enjoy the outdoors! On the way back towards Bozeman you can swing into Bozeman Hot Springs for another nice soak. This has cement and ceramic pools (like your regular community pool), but has natural hot springs water flowing in and out. It has multiple pools at varied temperatures, indoors and outdoors as well as a sauna and steam room. Family friendly, convenient, and lots of options. Head back to Bozeman for dinner. Pizza Campania has yummy fire-oven pizza or try some Asian-fusion at Sweet Chile. Move your home-base to Chico Hot Springs. Getting there will take you over the Bozeman Pass and into the gorgeous Paradise Valley. Large mountains and the Yellowstone River dominate the landscape. Enjoy a hike in the areas like Mill Creek or Pine Creek. A nice mountain waterfall is a good mellow destination about a mile in on Pine Creek Trail. Or go for the gold and reach the mountain Pine Lake after a strenuous 7 mile journey. The Yellowstone River also offers world-class fly fishing. Channel your inner Brad Pitt and cast a line! After a nice day of activity head to Chico and get checked into your room or cabin. Go for a soak, then, enjoy a 5-star meal at the Chico Restaurant. You will be dropping a pretty penny for this one, but it is TOTALLY worth it. If you just can’t squeeze it in the budget, no biggie, you can eat at the bar or the poolside grill instead (both on site). Play some shuffleboard, soak again, and do some county dancing to finish out the night. Chico has a great buffet breakfast, then head to Yellowstone National Park for the day. You will drive south on Highway 89 to Gardiner and through the North entrance of the National Park. Start off with a walk around the Mammoth Hot Springs Terraces. Then, head to Norris Geyser Basin. Most of the sites here require some walking to get to, but are definitely worth the effort. There are other more easily accessible sightseeing options as you travel south to Old Faithful. Get out and walk if you like, or make some stops to simply enjoy the sights. Midway Geyser Basin is a beautiful one, as well as many of the others in the area. If you find the time, make your way to West Thumb Geyser basin right on the shore of Yellowstone Lake. Although you are not allowed to soak in any of these pools, you will want to bring a camera and prepare to be amazed at all the different features hot water can create in the wild! When you’ve had enough, head back towards the North Entrance and stop for a soak at Boiling River, just 2.5 miles inside the North Entrance of Yellowstone Park. You’ll want your water shoes/sandals and a towel for this one. It’s about 1/3 of a mile walk out to the hot springs area. Natural, authentic, and relaxing. Return to Gardiner for dinner at the Yellowstone Pizza Company with a rooftop deck overlooking the Park. Then, head back to Chico for the night. Wake up for a morning soak in the fresh water (don’t worry, you can bring your coffee with you!). The pool is quiet in the mornings and mountain air is crisp. Relaxing, rejuvenating, and quiet. Head back south towards Gardiner to finish of your trip with a Paddle and Saddle Package. Get a little bow-legged with a nice ride through wild flower fields. Enjoy a quiet day in a more natural Montana setting. After the ride, eat a home style BBQ lunch, then head down to Montana Whitewater to finish your vacation off with a fun and splashy raft trip down the historic Yellowstone River. Whew & memories, good times, and hot springs galore! Wake up early to start the trip off right! Head east on I-90 to Livingston, then hop on Highway 89 South towards Yellowstone Park. Join us in Gardiner for a family friendly raft trip down the Yellowstone River. (If water isn’t your thing, we also offer zip lining and horseback riding out of this location). 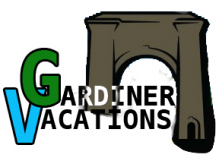 After some exciting splashes and gorgeous scenery (about a 3 hour round trip) grab a bite in Gardiner and head into Yellowstone Park. Get some snap shots under the Roosevelt Arch, tour the Mammoth Hot Springs area and continue to Tower/Roosevelt. Be sure to check out the hot pots and canyon views along the way. At this point you can opt to cruise east into the Lamar Valley for some prime wildlife viewing or continue South and check out the Grand Canyon of Yellowstone! When you’ve had enough turn back and head for home. If you still have it in you, stop for a soak at the Boiling River (a natural hotspring that flows into a river right at the North Entrance to the park) for a day one finale! Grab a bite to eat in Livingston the way back to Bozeman. The wood-fired pizza at Gil’s Goods is absolutely scrumptious. If local craft beer is your thing be sure to check out Neptune’s or Katabatic brewery! Check out the town! Bozeman has all kinds of fun to offer. Grab breakfast at the CatEye Café or the Nova for a taste of local favorites. Shop in historic downtown Bozeman and stroll through Lindley Park. Starky’s Authentic Americana specializes in delicious lunches. Take a hike up the M Trail for a nice mountain adventure close to town, with a spectacular view of the valley. If the weather isn’t ideal, take a trip to the Museum of the Rockies. Bozeman has a lot of great dinner options too like Montana Ale Works, McKenzie River, and many more. Be sure to look into local events for nightlife. If you are around on a Tuesday evening, the Farmer’s Market offers an enjoyable evening at the park or Thursdays will find you Music on Main- when Main St. downtown closes for a live band and vendors. Great mingling and dancing opportunities! Enjoy another day in the National Park. Cruise up the Gallatin Canyon and head to West Yellowstone (go south on Highway 191 all the way there). West has its own fun to offer like a journey through the Grizzly and Wolf Discovery Center or a great Yellowstone flick at the IMAX. Once you go into the park, head south to make sure you stop at Old Faithful. Continuing on to Yellowstone Lake is a fun option if you have the time. Once again, make sure you get out of the car and enjoy some of the easy strolls in the Park. When you’ve had enough, head back to the Big Sky area for dinner or continue to Montana Whitewater for an evening of Fly Fishing! We provide all the gear and an experienced, friendly guide to help teach you how to land a big one! Finish your trip with a bang and join us for the famous Zip & Dip Package! Soar across the Gallatin River like a bird on one of the Gallatin Canyon ZipLine Tours. Have a delicious lunch at Blazing Paddles Café, then enjoy the technical rapids and canyon scenery of the Gallatin River rafting trip! Stop for a bite at Stacy’s legendary steakhouse on the way home and see a small town Montana bar with a big steak! If you still haven’t had enough (and you can still float! ), stop for a soak at the Bozeman Hot Springs in Four Corners on your way back to Bozeman. Indoor and outdoor pools as well as saunas and steam rooms will relax you once more before your journey home!